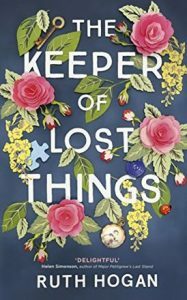 I’m thrilled to welcome Ruth Hogan to Short Book and Scribes on the day of publication of her beautiful book, The Keeper of Lost Things, which I reviewed here. She’s come along today to talk about her inspiration for what is such an innovative and unique story. 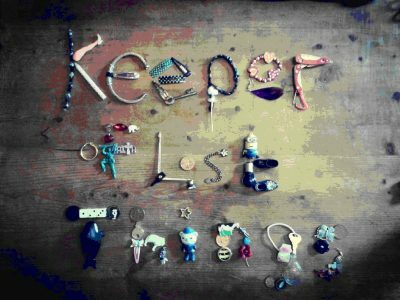 The Keeper of Lost Things began with a single sentence that came into my head on a train journey; that sentence became the first line of the novel, and as the story filled the pages, I filled my house with the lost things I found. I’m fascinated by documentaries and strange news items that provide a wealth of material for me as a writer. The idea for Keeper was initially sparked by two news articles – the first about the strange things that end up in Lost Property Departments, and the second about the fate of cremation remains that are never claimed from funeral directors. My leading man, Anthony Peardew, was inspired by a former neighbour of mine who, I was told, became a reclusive hoarder after the tragic death of his fiancée. It occurred to me that maybe he filled the space, both physical and emotional, left by her death with all the things he gathered over the rest of his lifetime. I named him Anthony and gave him a house called Padua, because Saint Anthony of Padua is the patron saint of lost things. Peardew was a little joke that I had with myself. It is pronounced in the same way as ‘perdu’ – the French word for ‘lost’. Anthony’s fiancée, Therese, was named after Saint Therese of Lisieux, who was also known as Saint Therese of the Roses, which just happen to be my favourite flowers. The notion of her ghost coming back and making mischief was great fun for me as a writer, but also an opportunity to show how strong the love was between her and Anthony, and the devastation that her death unleashed. As a writer, I’m not sure if one should admit to having favourite characters. It feels a little like admitting to having a favourite child. But I confess that I have a particular affection for a young woman in The Keeper of Lost Things called Sunshine. The irony is that I almost didn’t include her in the book at all. I knew that if I didn’t get her right, then it would be a disaster and I really wasn’t sure if she would work. In the end (and I probably shouldn’t admit this! ), I left it to fate. On my writing desk I have a round rock which I picked up on a beach in Wales years ago. On it is written a single word – ‘Trust’. It is a reminder to myself that sometimes you cannot force an answer; sometimes you must simply wait for it to come to you. And you must always trust your instinct. Whilst I was dithering about whether or not to include Sunshine, I went on holiday and took a ride on a restored steam train. During the trip, the guard on the train told us about the history of the engine and its restoration. He explained that it when it was built, it was named after the station master’s daughter, Heulwen. Heulwen is the Welsh word for sunshine, and there was my answer! I am by nature a magpie, so picking up lost objects everywhere I go for the last couple of years (in the name of ‘research’!) has been a delight. My long-suffering partner has not, however, always been so thrilled with the ‘junk’ I bring home. But that’s the whole point – one man’s junk is another’s priceless treasure. Some things are transformed into so much more than physical objects because of the emotions we invest in them: they become precious talismans and if we lose them we lose a part of ourselves as well. The lost things that I wrote about are, for the most part, humdrum, everyday items with little or no intrinsic value that I found on the streets, in parks, on beaches, in trains – just about anywhere you could think of. But to someone, somewhere they could mean the world. Each time I find something new (because, yes, I’m still doing it!) I wonder about who it belonged to and how they came to lose it. I worry about the child who lost the small, blue teddy bear that I found on a doorstep in the middle of town. I wonder about the set of house and car keys that I found in the park, and that were never claimed and I’m still delighted with the chandelier I found propped up against a wall that now hangs from a pergola in my garden! I have posted my finds on Instagram and Facebook, and now other people bring me lost things too. In many ways I have become the character that I wrote about. I am now The Keeper of Lost Things! Thank you so much, Ruth. Congratulations on publication! Please everybody, go out and get a copy of this wonderful book. As a child, I loved the Brownies but hated the Guides, was obsessed with ponies and read everything I could lay my hands on. Luckily, my mum worked in a bookshop. My favourite reads were The Moomintrolls, A Hundred Million Francs, The Lion, The Witch and The Wardrobe, the back of cereal packets, and gravestones. I passed enough O and A levels to get a place at Goldsmiths College, University of London, to study English and Drama. It was brilliant and I loved it. And then I got a proper job. I worked for ten years in a senior local government position (Human Resources – Recruitment, Diversity and Training). I was a square peg in round hole, but it paid the bills and mortgage. In my early thirties I had a car accident which left me unable to work full-time and convinced me to start writing seriously. I got a part-time job as an osteopath’s receptionist and spent all my spare time writing. It was all going well, but then in 2012 I got Cancer, which was bloody inconvenient but precipitated an exciting hair journey from bald to a peroxide blonde Annie Lennox crop. When chemo kept me up all night I passed the time writing, and the eventual result was THE KEEPER OF LOST THINGS. I live in a chaotic Victorian house with an assortment of rescue dogs and my long-suffering partner. I spend all my free time writing or thinking about it and have notebooks in every room so that I can write down any ideas before I forget them. I am a magpie; always collecting treasures (or ‘junk’ depending on your point of view) and a huge John Betjeman fan. My favourite word is antimacassar and I still like reading gravestones. 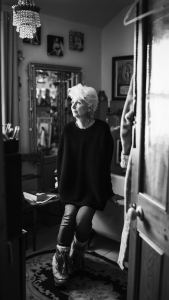 *Picture of Ruth Hogan courtesy of Ben Croker. This sounds like a very intriguing read – I will be investigating further! You should, Wendy, it’s fabulous.